It’s another Smashing Saturdays, boys and girls! That means it’s my privilege to cover the latest updates from the crew behind Smash Bros. Ultimate. While there are no new pokémon this week, they make up for it with 2 stage reveals, a new song and 3 character bios. But stay tuned, since I’ve also devoted this week to shining the spotlight on a very special Most Wanted Brawler. So let’s get Smashing! I have to admit, I’m a little surprised that Mii Fighter is making it to Ultimate. Yes, I know that Sakurai said everybody is back, but bear with me for a second. Mii Fighter is very much a relic of the Wii U and 3DS Mii functionality. Much as I loved the possibilities for creating fun characters they represent, I’m not entirely sure how they will play out in Ultimate. I truly hope we will still be able to make custom Mii avatars to pair with Brawler/Swordfighter/Gunner (in the 3DS Smash I had such Mii Fighters as Cee Lo Green and Ron Perlman, for example), but I’m not sure if that will happen. That said, I have high hopes for Mii Fighter in Smash Bros. Ultimate, especially since they will have 12 different voice options. Okay unpopular opinion time – I’m not a huge fan of Breath of the Wild. Don’t get me wrong, it does a lot of tremendous things and it was a great early showpiece for the power of the Switch, but I don’t want an open ended experience in my Zelda. That’s a lesson I learned in Link Between Worlds, which was easily my most disappointing Zelda game in quite some time. 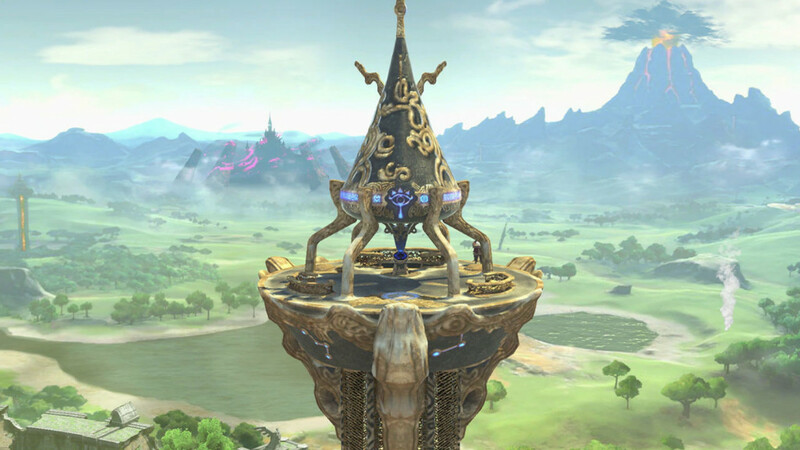 However, I also learned a while ago that the Zelda stages which show up in Smash are pretty great, and here’s another in Great Plateau Tower. The stage will fall apart as you battle, which is sure to provide some opportunities for mischief. And you can’t really argue with that scenic backdrop, which makes this a good addition to Ultimate. Are you ready for more unpopular opinions? Here’s one! I don’t like F-Zero. At all. The reason is simply that I’m horrible at racing games, and I prefer them to have weapons to help mix things up, such as in Mario Kart. That said, even I can acknowledge that the F-Zero series is iconic. So it’s nice to get another song from it in F-ZERO Medley. Composed by Takenobu Mitsuyoshi, it is a truly dynamic and energetic song, and it even has some unexpected singing. To listen to the song, just click here. 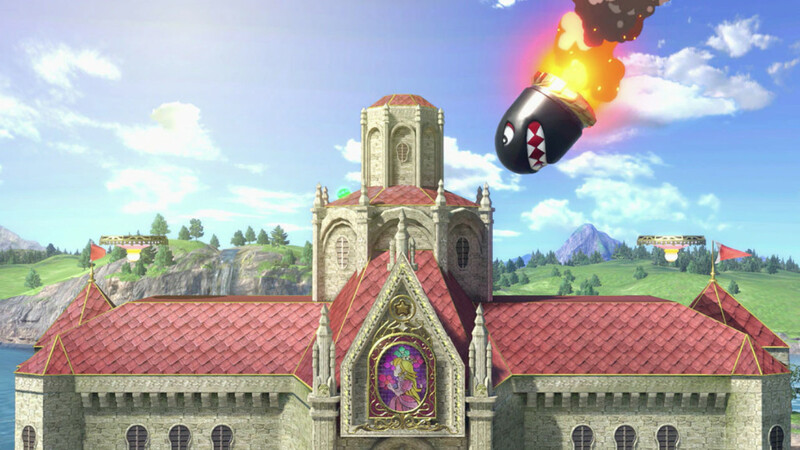 I’m really glad to see the return of Princess Peach’s Castle. Not just cause the pink powerhouse is one of my mains (though she is), but because it was a fun and unique stage. I loved using Banzai Bill to my advantage and hitting the switches to make make block spewing items appear. Plus it just brings back good memories from Melee. Here’s hoping they even found a way to add a couple more twists to this iconic stage. …SHOW ME YOUR MOVES! Yea, I know, I said I hated F-Zero, but there’s still something oddly charming about the good Captain. Captain Falcon is just such a strange character, with his flamboyant tight suit and fiery punches and kicks. That said, I still hate him, but not cause he’s horrible. I hate Captain Falcon because he usually decimates me with his fiery hug of death. Here’s hoping I can even the score in Smash Bros. Ultimate. But that’s not all! Please join me below for a very special Most Wanted Brawler! I warned you that this was coming! And I make good on my threats… er, my promises. All jokes aside though, I really think Slippy Toad deserves a spot in Smash Bros. Ultimate. Sure, Falco is cooler, Fox is faster and Wolf is meaner, but Slippy still has a lot going for himself. Unlike Lombardi, he’s a childhood friend of Fox. He’s a master inventor, having created things you may have heard of such as the Landmaster tank, the Arwing, the Blue Marine and even the selfsame Reflector used by Fox and Falco. Sure he’s not the most aggressive of the Star Fox crew, and he’s a bit of a klutz, but that shouldn’t make him ineligible. Frankly, I can see Slippy’s quirks making him a more interesting character, not less. Take his goofy antics, for instance. I can imagine turning those into an asset. Given his name, how amazing would it be if Slippy was the only brawler who actually could trip? Now imagine if that trip was beneficial, causing Slippy to crash head first into foes, dealing damage to any unfortunate brawler in his way? As for his technical expertise, while he could certainly use the same tools as Fox, Falco and Wolf, imagine if he could put his engineering skills to good use and amplify them? Much like Cloud, perhaps Slippy could spend time tinkering, and depending on his current level, his attacks would gain new attributes, such as his blaster shots becoming wider or Fire Fox leaving a blazing trail of flames, or even his Deflector randomly deflecting enemy blasts to enemies distant from Slippy. As for his Final Smash, I could see that going a couple different ways. They could take a page from Star Fox Guard and change the screen to a first person view, transforming all the other characters into tiny bipedal robots. Then Slippy could aim the targeting reticle and blast them away. The other possibility I could see for his Final Smash would be Slippy attacking all foes with some gargantuan mecha he specially invented for Ultimate, laying waste to them and making the Landmaster Smash look tame by comparison. 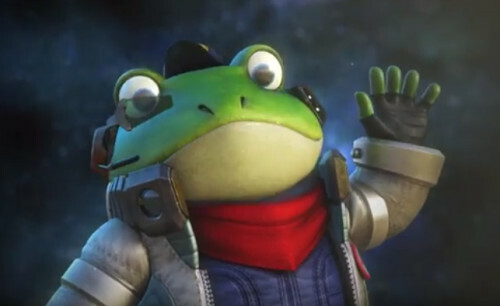 Either way, I really hope Slippy makes his way into Ultimate, even if it’s as a DLC character. So that’s it for this week’s Smashing Saturdays! Thanks again for joining us. Chime in below and let us know what you think about my vision of Slippy as a playable brawler, and tune in next Saturday for the next installment. To see more of the most recent Smashing Saturdays, you can click here!